The ETOW HL1-FR HumanaLight is an amazing light source kit. It was developed by the Ears To Our World nonprofit organization that specializes in the distribution of self-powered world band radios and other appropriate technologies to schools and communities in remote, rural and impoverished regions of our world. Reliable electricity is still not available to 25% of the world's population. 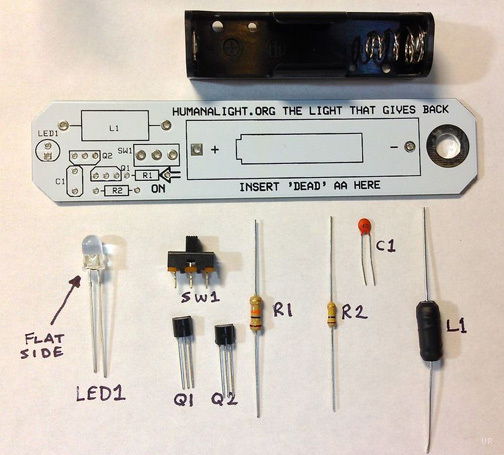 This simple light source is powered by a single AA cell (not included). And how long does it last? Not 5 hours, not 5 days, but up to 5 weeks! The simple (... yet magical!) circuit dramatically extends the life of the AA cell. Using a Joule-thief circuit, the HumanaLight pulls power from an otherwise ‘dead’ AA battery and renders it useful. Very useful if you are in the dark! You can insert a seemingly "dead" AA cell, and it will light for days. Another benefit of this item is that it makes a great first soldering project. And when you are finished you have built a useful device. Printed instructions are included and are also available on the Ears To Our World website. A third benefit of this item is that it helps support the great humanitarian work that Ears To Our World is doing worldwide. All the parts are supplied. Click here to view optional protective case.